Germany’s Gamma Ray are one of the most dependable metal bands in the world. You can always count on them to produce an album of traditional metal inspired by the likes of Judas Priest, Accept and of course Helloween, which was the original band of G.R. frontman Kai Hansen. This sort of sturdy reliability can be considered a drawback for those looking for constant innovation and originality. That’s not what you’re going to find on Empire of the Undead. However, you will find some welcome variety on the album. Not every song is in the vein of Helloween and Priest (although you will find those, too). The tracks here range from epic symphonic power metal to stripped down hard rock and also the obligatory metal ballad. 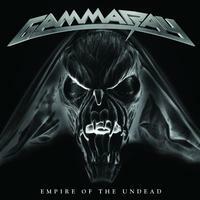 The balance of the album is excellent and it seems fresher than the last Gamma Ray release, To the Metal. You can just about bet your last Deutschmark (or Euro, I guess) that you’ll get a good album out of Gamma Ray and this is no exception. We begin with the sound of an ocean shore, a subdued electric guitar and melodic, balladic vocals from Kai Hansen. It doesn’t take long before a powerful epic riff and waves of synth kick in. This is the longest song on the album, which is something you’d usually expect the last tune to be, not the first. If you’re not a fan of huge sounding European power metal, you may find this too pompous, but it’s a good example of that style. Snarling feedback, a thrashy riff and loads of squealing guitar announce that this is a much different song to its predecessor. This really has the feel of one of those fast Judas Priest screamers like “Ram It Down” and “Eat Me Alive.” There’s also some of that Helloween melody on the chorus. There’s a guitar duel that would warm the hearts of Tipton and Downing. It’s a derivative track but a surefire headbanger. The simple metal chug that forms the background of this tune reminds me a lot of Gamma Ray’s countrymen Accept. Hansen’s rougher vocals even sound like Udo Dirkschneider a bit. However, there’s an epic feeling to the vocal melodies on the chorus that are pure Gamma Ray. As basic as this track is, it really rocks hard. This tune has a catchier rock and roll feel to it and sounds like it would have fit in well with the radio hits of the late 80s. I really like the chorus on this, but when you hear lyrics like “Born to fly like an Eagle in the Sky,” you can’t help but think of the Helloween classic “Eagle, Fly Free.” The guitar soloing and twin axe harmonies are exceptional. This is one of my favorite cuts here. Here’s some bouncy European power metal that finds Hansen trying to sing in a lower register, which I’m not sure suits him here. This song isn’t a million miles away from “Born to Fly” and definitely sounds like something that could have fit very well on the early Helloween albums. I guess that’s to be expected since Hansen was the architect of much of that sound. The lyrics are a clever tale of how the recording of Empire of the Undead was disrupted by a massive fire. Here’s another fast paced face-ripper that even manages to start with a death grunt. The track is about as original as a TV reality show but the energy and fury behind it can’t be denied. 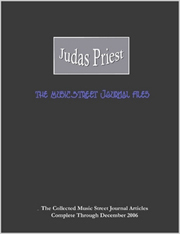 This is where Gamma Ray really tips their hat to Judas Priest. Except for Hansen’s vocals, this could have been on Painkiller. Now it’s time for the obligatory ballad and this is actually a good spot for a “cool down” on the album. It’s quite subdued and melancholy, with Hansen again singing in the lower register. When we get to the chorus, there are some surprising Queen-like harmony vocals and a huge pompous sound. Strings and symphonic keys come pouring in like a downpour at the end. The tune is on the corny side… but that’s part of what this music is about. Horror movie samples start this ominous, heavy tune. This is a pounding metal bruiser with some majestic riffing to propel it. There’s some pretty pompous melody going on here, too. On average, this is the heaviest and most grinding tune on the disc, but not without moments of light and shade. This gets my nod for best song of the album. If you were to ask me to construct the ultimate Gamma Ray song, this would be it. It’s fast and neck-snapping. The vocals on the chorus are amazingly catchy and there’s that hard-to-define “Teutonic” sound that we find on bands like Accept, Helloween, Running Wild… and Gamma Ray. This is an extremely well constructed tune with many facets. On the last song, the band tries to combine a gritty metal sound with aspects of the fluffier, more epic power metal vibe. It rocks out pretty hard and I hear echoes of Queen’s Brian May with some of the multi-tracked guitar. The chorus is pure Helloween and you can see knights in armor riding across the landscape when that kicks in. I would have flipped this song with “Seven” in the running order myself, but it still ends the album on a strong note.